Say wah? Thassright - wah baby! Big, bold, badass wah wah. That wah tone you've been searching for.... That wah wah tone that makes you think of John Shaft walking down the street....That wah tone you've heard on records but could never seem to get. Vintage-inspired....but better! That's what you get with the Area 51 Wah. Here's the deal: Not all vintage wah wahs were created equal. Some are downright magical, and some are, well.......let's just say... less than inspiring. One of the keys to building a magical wah, is understanding those things that make it "magical" in the first place. Equally important, is how to make it repeatable. I test every single one alongside a reference wah to ensure that they are extremely consistent. That applies to the wah kits also. I plug each board into a jig for sound testing. This is something that the big companies simply cannot do. Standard 2.1mm DC Jack with filtering and regulation - compatible with pedalboard power supplies and any other "Boss" type 9VDC, center pin negative supply wallwart. True Bypass wiring - Won't alter your tone in bypass mode. High quality vintage style carbon composition 100K S-taper (ICAR style) wah pot . 5 Position Range Selector - Gives you FIVE different wah voices! 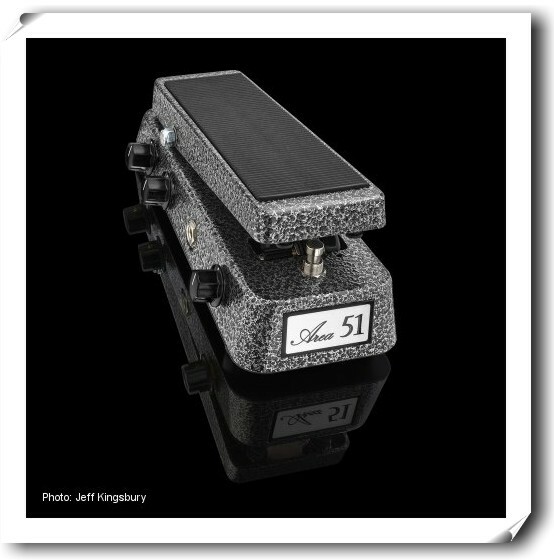 The center position is "stock" - the normal Area 51 Wah voicing. You also get 2 below (more bass, less treble) and 2 above (more treble, less bass). Another way to put it - It gives you "woh woh" and "wee wee" in addition to "wah wah". Quack Control - This controls the smoothness of the sweep, or....the Quack. All the way down for super smooth - all the way up for mega-quack. About 1/3 of the way up is the stock Area 51 setting. Growl Control - This one is useful for those of you who want a very clean wah tone. It's a "subtractive" control - meaning it removes growl. Growl is that clipping on the low notes that you get with a wah when it's rocked back into the bass position. The stock Area 51 setting is full up. LED - Bright blue LED - side mounted for good visibility. Lefty Option - Lefty? Say wah?! Yes indeed! Here's the story: My good friend Paul Bento from MHA, Carnivore, and WRENCH in NYC requested this as an option on the latest wah that I built for him. He's a left handed player, and has always hated how his guitar cable crossed over his wah and got in the way. He asked if I could make him a "lefty version". I said, "Man, what a great idea." I built his that way, and now I'm offering it to all of our customers as a no cost option. Everything is the same, except the input and output are reversed. Please note: When your order a wah directly from our website, it is custom-built for YOU, and there is usually a wait time. It varies depending on many factors, but the average is 4-6 weeks. If you don't require a custom set of options, you may want to purchase one from one of our dealers. The dealers will generally have a few option sets in stock, such as All options, Standard, and Buffered version. Or check my in stock page.